A Dodger family photo featuring Scott Van Slyke, Yasiel Puig, Juan Uribe and Adrian Gonzalez. Pic via Dodgers tumblr. Via Mark Saxon at ESPN, "Zack Greinke capable of getting on a roll". Greinke isn't just a good pitcher, he's a streaky pitcher and -- like a lot of things in this rapidly improving Dodgers season -- his fortunes appear to be on a rapid ascent. Saturday's 1-0 shutout of the Colorado Rockies, in which he gave up only two hits and struck out nine batters in 110 crisp pitches, was only the latest evidence. Ron Cervenka at Think Blue LA shares a great story about how Yasiel Puig gave the shirt off his back to a wheelchair bound Dodger fan during Photo Day. 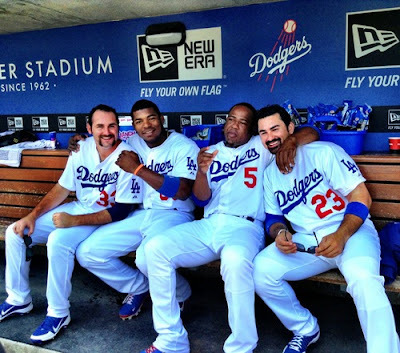 Speaking of Photo Day, Roberto at Vin Scully Is My Homeboy shares some of his pics from the day. Via Scott Miller at CBS Sports, "Weekend Buzz: Dodgers' decision on Don Mattingly among first-half bests". Dustin Nosler at Feelin' Kinda Blue shares his Top-25 mid-season Dodgers prospects. Wow! Dodgers photographer Jon SooHoo shares a bunch of pics that he took from inside a blimp abouve Dodger Stadium. See them here. BTW, Freddie Freeman (who won against Puig in the Final Vote) injured his thumb and will not go to the All-Star Game. 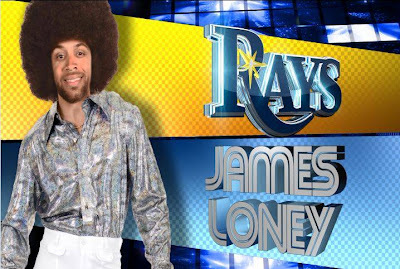 His replacement will be Brian McCann. Via twitter @Braves. Brian McCann will replace Freddie Freeman in this year's All-Star Game. Tim Brown at Yahoo writes, "Dodgers prospect Joc Pederson inspired by older brother's perseverance". 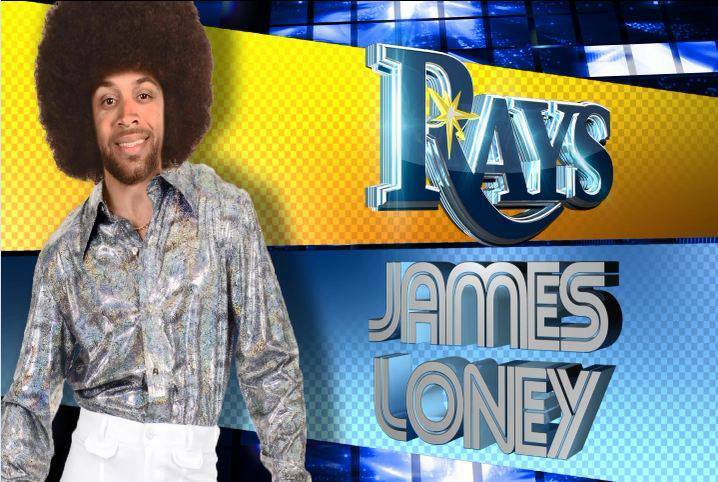 They had Disco Night at the Tampa Bay Rays, and I thought you would get a kick at seeing Disco Loney. See more pics here. Hat Tip: Reddit. Susan Lulgjuraj at Beckett writes about the MLB All-Star FanFest in NY and shares a whole bunch of great pictures. Sports Collectors Daily also shares a whole bunch of photos from the MLB All-Star FanFest. Patrick Reusse at the Star Tribune wrties, "Nine traditions lost from baseball".